Altaro is a fast-growing developer of easy to use and affordable backup solutions for small- to medium-sized businesses, specializing in backup for virtualized environments. Their aim is to delight their customers with full-featured, affordable backup software backed by an outstanding, personal Support team who are determined to help you succeed in protecting your environment. "I have looked at Dell AppAssure, Symantec Backup Exec, Veeam Backup, Acronis, Overall, yours is just as good if not better, much more simple (and I like simple), and did I mention you have the best price also? David Owen, IT Manager, The McNeely Companies"
Altaro VM Backup is a hassle-free, affordable backup solution for Hyper-V and VMware virtual machines, backed by outstanding support. Install the software and start your first VM backup in under 15 minutes, without training or advanced knowledge. With an intuitively designed user interface Altaro VM Backup is easy to use, doesn’t require any additional software to run and doesn’t break the bank. Back up live Hyper-V and VMware VMs with zero downtime and Cluster Shared Volumes with ease. Replicate selected VMs to an offsite location for disaster recovery protection through your internet connection, boosted by WAN Acceleration. Replicate directly to offsite storage or by enabling drive swap rotation on selected drives. Compress VM backups to reduce backup storage size significantly and use military grade AES encryption to secure VM backups. Schedule backups the way you want them, setting grouped backup schedules or schedule backup jobs for individual VMs. Back up VMs to multiple backup locations. Specify backup retention policies for individual VMs. Being able to execute quickly and easily, having complete control over backup/restore jobs is crucial. Altaro VM Backup provides you with quick access to all hosts in your environment. Central management console - Full control over multiple instances of Altaro VM Backup in your environment, through a single pane of glass Intuitive user interface - Anyone can use, no expert required. Sandbox Restore Tests can be performed to verify backup integrity, manually or fully automated. Run backups for multiple hosts concurrently, drastically reducing time required to back up multiple Hosts. Altaro VM Backup is a logical evolution from a backup solution that excelled at protecting Microsoft Hyper-V virtual machines, to a solution that offers full support for both Hyper-V and VMware. Managing VM backups and restores has never been easier, offering the ability to back up VMs from hosts running VMware as well as those running Hyper-V. All from a single console, with all the functionality you need to help you set up rock solid backup strategies on both hypervisors. VMware administrators are now able to back up VMware VMs in the same way that Hyper-V administrators are used to: Hassle-free. You can download and install Altaro VM Backup on a machine running Microsoft Windows Server 2008 R2, 2012, 2012 R2 and Microsoft Windows 7 (64-bit) and Windows 8 (64-Bit). 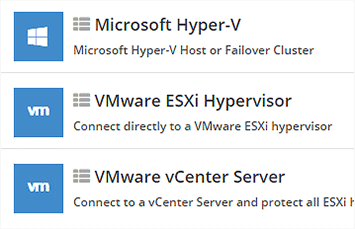 You can back up the following VMware hosts: VMware vSphere and ESXi 5.0, 5.1, 5.5 and 6.0, vCenter 5.0, 5.1, 5.5 and 6.0. It should be easy to protect your data. It should must be powerful and flexible - so that you can achieve your goals for disaster recovery. This is Backup and replication you can bank on. You can replicate selected VMs to your off-site location for disaster recovery protection. It can be to your own offsite storage ( via your internet connection - with optimized transfer speeds through WAN Acceleration) or it can be through enabling drive swap rotation on selected drives. Compress your VM backups with military grade AES encryption in order to secure VM backups - as well as significantly reduce backup storage. If your organization's data is on the line, regardless of how excellent your backup is - it's meaningless if you don't have the reliability, flexibility and speed to get back up and running. Altaro's VM Backup provides a suite of tools to recover what you need, QUICKLY. Browse your Exchange VM backup’s file system and you can instantly restore any Exchange items, including individual emails. With a few clicks, you can retrieve individual files directly from your VM backups. Altaro VM Backup can reliably and quickly restore whatever you need. Whether it's your entire VM or even just individual items like emails or files. Get back in business fast with doing a quick restore of new and old backups (through optimized performance). Watch an introduction to Altaro's VM Backup (formerly known as Altaro Hyper-V Backup) solution. Altaro VM Backup (formerly known as Altaro Hyper-V Backup) is an easy to use backup software solution to back up and restore both Hyper-V and VMware-based virtual machines from within the same application. Eliminate hassle and headaches with an easy-to-use interface, straightforward setup and a backup solution that gets the job done every time. Altaro VM Backup v6 is here, which includes the #1 requested feature: VMware support! This means you can now use the same powerful functionality to back up both Hyper-V as well as VMware VMs from the same interface. Our specialists are expert in designing backup solutions and can help you create a plan for sourcing and deploying your Altaro installation. Optrics offers personalized Altaro Solution training - a service designed to help you integrate your Altaro backup solution smoothly into your network infrastructure. Altaro Hyper-V Backup v4 delivers what anyone would need to successfully back up and restore Hyper-V-based systems and even goes a bit further, delivering some innovative features that speed backups and introduce flexibility into the process.